All pictures and text on this site are copyrighted ©1982-2018 Alex Peck. All rights reserve. A fine c. 1860 amputation and trephination surgical set with instruments marked: GEMRIG. The lift-out tray retains the paper label: MANUFACTURED / BY / J.H. GEMRIG / 109 South Eighth St. / PHILADELPHIA. 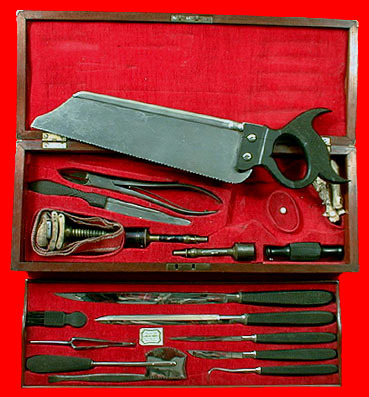 The antique surgical kits is complete with its original sixteen instruments, and ten have ebony handles. The capital saw has a peculiar handle that is seen in sets by the English maker Wood, but only used in America by Gemrig. The instruments, case, and red lining are in superb condition. DO YOU HAVE A GREAT SURGICAL SET TO SELL? I WANT YOU TO GET THE VERY BEST PRICE! For additional surgical sets and other medical antiques, visit the various sections of this web site.